Originally posted on The Conversation. The epic of Atrahasis is one of the most significant pieces of ancient Babylonian literature. It describes a creation myth, a great flood and the building of an ark, that significantly pre-dates a similar account in the Bible. The epic has survived millennia on clay tablets inscribed with cuneiform script. But the third tablet of one of the most complete surviving copies is broken. This potential join has been hypothesised for over 50 years, but never physically confirmed. Now, using 3D computational geometry, there is no longer a need to manoeuvre the physical fragments into the same room. Instead, we built 3D virtual models of the fragments and demonstrated that they join precisely. This is the first time that a long-distance virtual reconstruction of a cuneiform text has been achieved. Cuneiform script is one of mankind’s earliest systems of writing. It was in use for some 3,000 years in and around Mesopotamia (the region of modern day Iraq and Syria). The script was written on clay “tablets” by making wedge-shaped impressions with a reed stylus. Many thousands of inscribed tablets have been excavated in the last 200 years, but they are, typically, fragmented. Joining pieces are now distributed within and between museum collections worldwide. This enormously complex worldwide 3D jigsaw puzzle constitutes an unknown number of complete and incomplete tablets. The epic of Atrahasis has particular cultural significance in that a large part of the narrative concerns how the Babylonian gods, displeased with mankind, elected to send a great flood to cleanse the world. One of the gods, Ea, took pity on mankind and gave Atrahasis instructions to build an ark to preserve humans and animals alike. A modified version of the story is included in the epic of Gilgamesh in which the character of Atrahasis is replaced by Utnapishtim. The protagonist is Noah in the later account in the Old Testament. The tablet that we were working with belongs to one of the most famous and complete copies of the epic of Atrahasis, known as the “Old Babylonian” copy. It was written by the scribe Ipiq-Aya in the southern Mesopotamian city of Sippar around 1635BC. Although a join between the fragments of the third and final tablet in the epic has been long suspected, it has never been verified because one of the fragments is housed in London; the other is in Geneva. Recent advances in 3D computational geometry have made it possible to create accurate models of physical objects from sets of photographs. This makes virtual reconstruction a possibility, regardless of the physical separation of fragments. Once in virtual form, potential joins can be discovered by mapping the elevation of the “terrain” of each fragment and then matching the peaks and valleys on one with their opposing features on the other. A perfect geometrical match can be confirmed if an orientation can be found where the distance between the fragments is zero across the whole of the joining surface. This technique has already been successfully applied to the automated joining of fragments from the ancient city of Uruk, for example. However, virtual joins had never been reported for fragments held in different collections. But, of course, physical separation of fragments is no barrier to virtual reconstruction. So during the summer of 2017, we took about 150 photographs of each fragment, C₁ and C₂, to compute detailed 3D models. It is not obvious, when manually aligning these virtual fragments, that they will fit well together. A close-fitting join only became apparent when our automated virtual reconstruction algorithm was applied. The result was a near-perfect match between the inner surfaces of the two fragments. 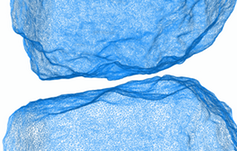 A depth-map visualisation of the distance between the two matching surfaces shows a significant joining surface area. At the edges of the tablet, the quality of the join deteriorates due to erosion, as is clearly apparent on the original physical artefacts. A possible join between the Atrahasis fragments in London and Geneva has been speculated for over 50 years. We can now declare, with certainty, that the match is confirmed.